Ask my husband what his favorite food is, and he’ll undoubtedly say risotto. (Food that I make, that is; his favorite food of all time is crab cakes, which I rarely prepare, unfortunately.) Risotto is elegant and comforting at the same time: creamy, complex, and deceptively rich. And oh so versatile! Make it with chicken, beef, vegetable or mushroom stock; with roasted tomatoes, butternut squash, spinach or asparagus; or just plain and simple, with a pinch of saffron for color and smoky flavor. 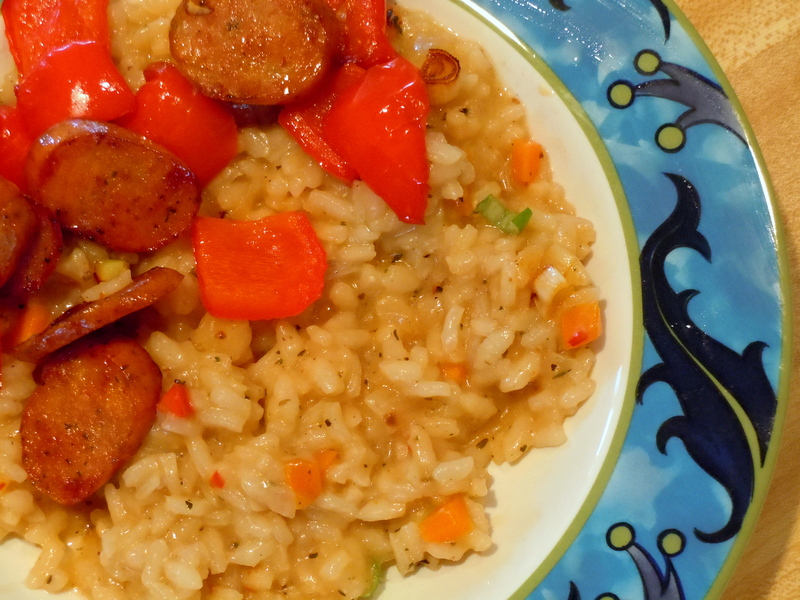 I started experimenting with risotto years ago, when we still lived in the D.C. area, and I could only find Arborio rice at a specialty store. The packaging informed me, in English badly translated from the original Italian, that I would most likely fail the first several times I tried to make risotto. (I wish I’d saved that box; the tone was so forbidding it was actually quite funny.) Luckily, I had the arrogance of youth to bolster me, and ignored the dire warnings. I quickly learned that risotto is easy to make if you’re willing to follow a few simple rules. • First, you must use a rice specifically meant for risotto. The grains are short to the point of almost being spheres, and contain considerably more starch than long-grain rice. Arborio is the most readily available; Carnaroli is another type. Never rinse all that lovely starchiness away—that’s the necessary ingredient in the alchemy that is risotto, the element that creates that amazing sauce. • Second, your liquid kept at hot and added bit by bit, not all at once as with most steamed rice dishes. The slow addition of liquid coaxes out the starch from the rice, creating risotto’s signature creaminess. Keeping the stock at a simmer ensures that the rice continues to cook at the same temperature when you add liquid. Don’t boil it, though; the flavor will concentrate as the rice cooks, so you don’t need a reduced stock to start out. The ratio is about 4 cups liquid to 1 cup rice, but it helps to have extra warm liquid ready to go. • Next, don’t leave the risotto for more than a minute at a time once you start cooking. This is where your mise en place becomes essential. Mise en place is the French term for having all your ingredients prepped and ready to go. Risotto requires nearly constant stirring, so you won’t have all that much time to chop, grate and measure once that rice is in the pan. Call on your inner boy scout and be prepared! Risotto doesn’t take forever to make; a few minutes of chopping aromatics, grating parmesan and putting stock on to simmer in the beginning, then 20 to 25 minutes of actual cooking. That’s it. Because it does demand the lion’s share of your attention (and two burners of your stove), I often make it as a one-bowl dinner. I’ll add some cooked chicken (or salmon or shrimp or sausage) and sautéed spinach (or steamed peas or roasted peppers) at the end for a main meal. Or I’ll make risotto as a side dish if my husband is manning the grill. Plain rice, even Arborio, is bland on its own. Risotto always begins with some aromatics as a flavor base. I start with minced onion, carrot, and a little bit of garlic sautéed in olive oil. Add celery or diced bell pepper to the sauté if you have them. I add dried herbs at this point, to let the oil absorb the herbaceous flavor. If you have fresh herbs, add them at the end instead, or do both: a half-teaspoon or so of dried in the beginning, and a few tablespoons of fresh at the end. Then add the rice and sauté it for about two minutes. It will become a bit transparent as it absorbs the oil. Before you dip your ladle in that simmering stock, add a splash of wine to the pan. It will absorb almost immediately, and provides that acidic kick that boosts the flavor of almost everything. Start adding stock about a half-cup at a time. Add more as soon as most of the liquid has been absorbed. This goes really quickly in the beginning, and you’ll think that you’re gonna need a heck of a lot more than you’d planned for. Patience; the process will slow down in a few minutes. After 20 minutes or so, the grains should be plump and tender but still with some chewiness (but no hard crunch). Stir in a handful of grated Parmesan and some chopped parsley. If you’re in a decadent mood, add a knob of butter. It’s not necessary, but hey—it’s butter! Do I really need to say more? I topped a basic risotto with some sautéed chicken andouille and red bell peppers, and passed a bowl of grated parmesan. Ultimate end-of-winter comfort food. I made enough for leftovers. Next post: how to use all that starchy leftover goodness! Heat the stock to a bare simmer in a saucepan over medium heat. Reduce heat to low. Have a ladle ready. In a large skillet or wide saucepan over medium heat, sauté the onion, carrot, and garlic in oil until vegetables are tender, about 5 minutes. Add the rice and sauté for 2 to 3 minutes, or until rice is becoming translucent. Season lightly with salt and pepper. (Be cautious with the salt at first; the stock has salt too.) Add wine and cook, stirring, until wine is mostly absorbed. Add about ½ cup of the hot stock and cook, stirring, until the liquid is mostly absorbed. Continue adding stock about ½ cup at a time in this manner until the rice is tender but a bit chewy, and most of the liquid has been absorbed. 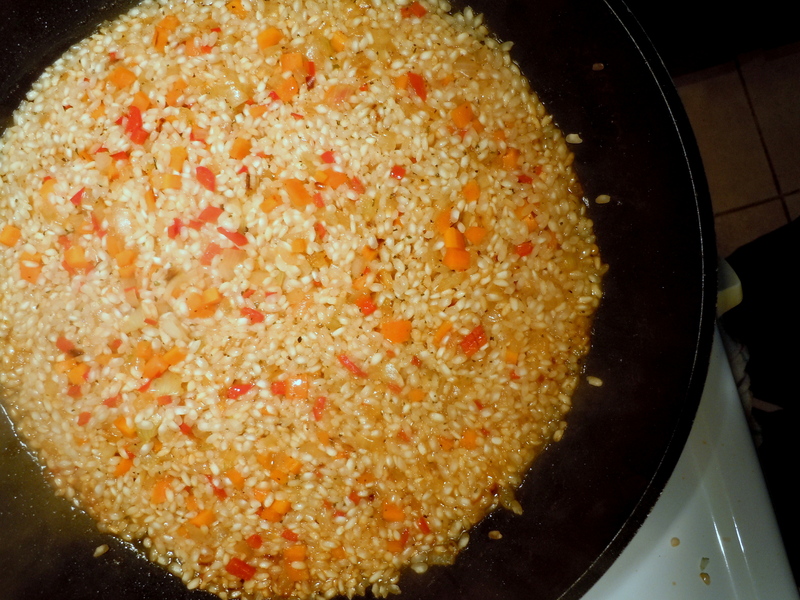 The rice will absorb the liquid very quickly at first, and then less so as the dish finishes cooking. You want to keep the rice at a brisk simmer the whole time; cooking should take 20 to 25 minutes. Stir at least every minute or two so that the rice absorbs the stock evenly. When the rice is just about done, stir in the parsley, Parmesan and butter, taste, and adjust seasoning if necessary. Serve immediately. This will feed 4 people as a side dish. This entry was posted in main courses, pasta, rice, and grains, sides and tagged arborio, cheddar, rice, risotto. Bookmark the permalink. Thanks for the thorough exposé Nancy! I aspire to cook more and you’ve added to my confidence by covering this topic from so many angles. Thanks, Bruce. I’ve always found those extra details to be really helpful in the kitchen. I’m so impressed. You really are the Martha Stewart of Waupaca! Without all that prison business and all. Thanks, Peg. Yeah, staying out of prison is an easy goal to reach when you don’t have the funds for insider trading. I’ll stick to cooking, writing and editing for now.